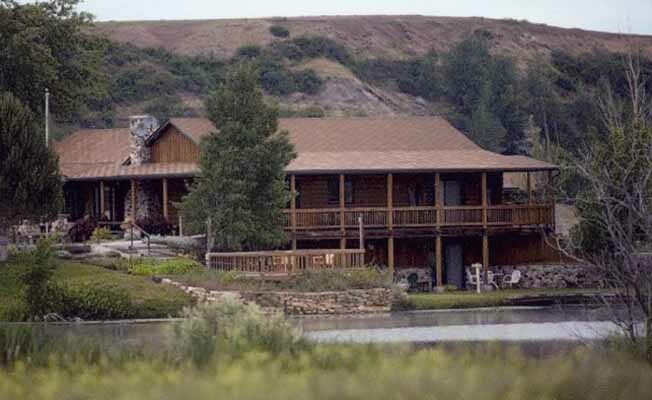 Situated on 20 acres on the banks of the Bighorn River, Bighorn River Lodge offers all the amenities of a first class resort. Professionally guided trips, friendly staff, exceptional cuisine, full service accommodations, and a beautiful setting combine to make your stay a wonderful experience. Whether an experienced angler or a fly fishing hopeful, we invite you to be our guest at Bighorn River Lodge. The main lodge features Montana-style comfort and décor. The Lodge hosts five bedrooms, each equipped with two beds a private bathroom. King size beds are available for couples upon request. A large living room and dining area create a gathering space for guests to mingle, play cards and share fishing tales. A five-acre pond stocked with large-mouth bass, carp and a few trout sits at the center of the property. Guests can enjoy fishing off the dock, paddle-boating, or walking around the premises. Our all inclusive package includes meals, lodging and guided fishing trips. Expect to dine with us on the evening of your arrival. All meals including breakfast, boat lunches and dinner will be provided during your stay. Breakfast will be served on the day of departure. Alcoholic beverages are not included in your stay. Please bring your own alcohol, if desired. Guides and Instruction - Bighorn River Lodge guides are known for their knowledge of the river. Our guides spend hundreds of days on the river each year and will be happy to help you with all elements of technique. They guide many clients who are casting a fly rod for the first time and also seasoned anglers who have been fly fishing their entire lives. They are devoted to their craft and will do everything possible to help you enjoy your time on the water. We look forward to continuing to serve you at the highest level. See you soon!